OnboardCentric is an employee onboarding platform for U.S. based SMB employers that helps optimize the collection of information while reducing paperwork and redundancy. New hires are invited to fill out forms and view and sign documents electronically from the web-based portal. Key features include form auto-fill, electronic signatures, E-Verify integration and task workflow customization. OnboardCentric helps automate onboarding paperwork by guiding new employees through the questions necessary to complete new hire employment forms such as federal tax forms (W-4, I-9), state and local tax forms, direct deposit authorization, handbook and policy authorizations, emergency contact information, and security and network access. The onboarding application automatically collects basic information to determine the paperwork required based on the employee’s location, division, position type and more. OnboardCentric populates the necessary forms with the data collected in initial interviews and allows newly-hired employees to review and/or electronically sign the forms. Organizations can ensure that no paperwork processing is delayed by enabling notifications which alert staff and/or department managers to authorize or approve forms electronically. New hires can also receive reminders and view deadlines by logging into their personal dashboard. OnboardCentric’s FlexField feature helps identify the criteria for each new hire, and ensures that follow up tasks are assigned to the correct staff members. Organizations are able to provide personalized digital “new hire packets” which contain documents, tasks, and forms assigned to a particular new hire. Users can also link training videos and how-to guides, as well as important web pages that need to be reviewed by new employees. Integration with E-Verify enables the streamlined verification of employment eligibility, and keeps all compliance-related data in one place. WOTC integration is also available for employers to take advantage of the Work Opportunity Tax Credit. We have had a great experience using Exact Hire - awesome value! A very easy to use platform for our applicants, major focus on the customer. The team is great, customer service is a focus for them and we always receive timely responses. The system is a great value for a company of our size. The team is great, customer service is a focus for them and we always receive timely responses. The system is a great value for a company of our size. There are sometimes certain features or functions we wish Hire Centric had but it seems Exact Hire is always working to make improves and keep up with the times which we appreciate. Alex, thanks so much for your comments about our customer service and commitment to progressive feature updates. We're glad that your employer is realizing great value in using OnboardCentric employee onboarding software as well as our HireCentric applicant tracking system (per your HireCentric comment). Overall, OnboardCentric has helped our company streamline our hiring process, allowing it to be more organized and ensuring that each employee completes all the required documentation without having multiple papers to track. OnboardCentric provides an efficient way for our employees to complete their necessary hiring paperwork. It allows our company to provide the information to our employees regardless of their location. OnboardCentric also allows our company to be more paperless and have a "storage" for our employee documents. I like that each employee has their own "locker" where we, the employer, can easily access their files. OnboardCentric provides an efficient way for our employees to complete their necessary hiring paperwork. It allows our company to provide the information to our employees regardless of their location. OnboardCentric also allows our company to be more paperless and have a "storage" for our employee documents. I like that each employee has their own "locker" where we, the employer, can easily access their files. The software is not as straight forward as it relates to assigning specific packages of documents to specific categories of employees. Thanks for taking time to submit a review of OnboardCentric and we're glad that it has allowed your non-profit organization to achieve paperless onboarding. If you ever need assistance with assigning packets to various employee categories, our Client Services team is happy to help. I do like that we are able to complete all paperwork remotely and that are documents are automatically updated. The software is glitchy and can add a document more than once. Go through all your packets over time and execute them accordingly. Hi Je Ann, thanks for taking time to review OnboardCentric. We're glad our software is user friendly for you, but would love to find out more about what you mean when you reference that it may not be for all of your employees--we're here to help, so please feel free to contact us at support@exacthire.com. Additionally, we'd be happy to review whether your particular packet setup is inadvertently causing extra form additions. That is houses some of our onboarding documents. Unfortunately to change or add documents is very costly. The state tax forms are not pre-loaded. Not compatible with Internet Explorer. Does not update fast enough. Have to make sure that candidates are using a browser other than IE when they are completing onboarding process, training was inadequate, have no idea how things feed (could be our issue and the way it was set up with former team). Hi Dorinda, thank you for your candor! We're sorry to hear that you have some complaints with our system, and we wanted to clear a few things up as well as offer additional assistance, if desired. The state and federal tax forms are included and pre-loaded into the standard forms area of the system. In regards to browser support, as a SaaS platform committed to the security of our clients' data, we support our clients' use of modern browsers which include the newest version of major platforms (e.g. Chrome, Firefox, Opera, Edge and Safari). Internet Explorer (IE) was replaced by Edge. We do understand that many organizations run other legacy software that requires an older platform, and so we support each of the browsers mentioned above up to two versions back, as well. Please reach out to our support team if we can help in any way including providing more clarity in regards to your comment about "how things feed." I have been using ExactHire for recruiting and selection for just under a year. It's been great! This system has organized our applicants and has allowed us to keep up with the high traffic that we see here with candidates. It's been easy to communicate with our hiring managers and has led to less time in the selection process. ExactHire has helped tremendously with my time management throughout the process from job requisition to hiring. I can say that when I have noticed challenges in finding my way through the system, the support team has been helpful every time. 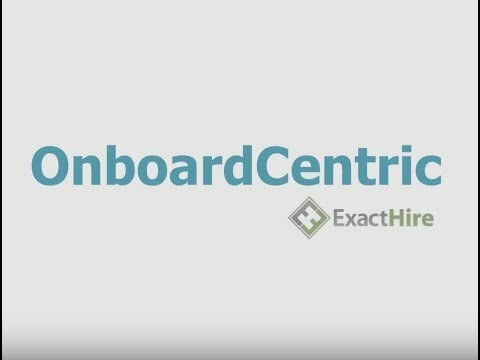 Jennifer, thanks for taking time to review our employee onboarding software, OnboardCentric! We're happy to hear that you've had such a consistently positive experience with our support team when you have questions. OnboardCentric pricing starts at $150 per month. Ensure all onboarding tasks stay on track with automatic reminders triggered daily for incomplete items past their due date for existing staff members. Guide new employees through the completion of new hire employment forms with custom questions necessary for the organization. Share digital documents with employees for future reference and enable the ability to sign completed forms digitally with a valid electronic signature for required reading. All forms are stored in the cloud and accessible to users on demand. With OnboardCentric, new employees get the benefit of auto populated forms across all required paperwork to avoid filling out the same information multiple times. Link how-to guides, training videos, and company handbooks to help new employees with training assignments within OnboardCentric. Below are some frequently asked questions for OnboardCentric. Q. What type of pricing plans does OnboardCentric offer? Q. Who are the typical users of OnboardCentric? Q. What languages does OnboardCentric support? Q. Does OnboardCentric support mobile devices? Q. Does OnboardCentric offer an API? No, OnboardCentric does not have an API available. Q. What other apps does OnboardCentric integrate with? Q. What level of support does OnboardCentric offer?